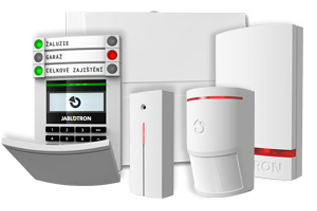 Professional wireless security has never been easier. Expandable, remote-controlled, easily adjustable. And it looks good too! 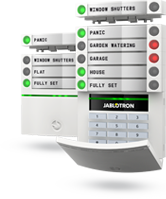 The JABLOTRON UK 100 is a revolutionary wireless burglar alarm or wired hybrid system designed to protect premises. Suitable for both residential areas as well as shops, offices, warehouses, workshops, etc. 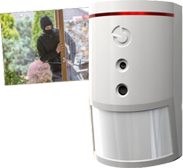 It can report a break-in, fire, health problems, assault and other possible risks. The system also offers home automation (the remote control of appliances, heating control, switching appliances on with a motion detector, detectors for sensing door/window opening or remote control). 4 GB memory for event storage, voice messages, image saving etc. The JABLOTRON 100 is the first alarm immediately understandable to everybody thanks to its revolutionary control system and so you need not ever be afraid of it. Install for yourself an alarm developed for people! The appearance of the individual system devices has been created in cooperation with top designers. Discover the beauty of the JABLOTRON 100 alarm! 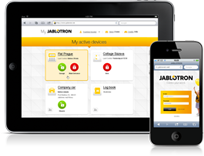 You can easily access your JABLOTRON 100 alarm from a remote computer or smart phone. Thus you can provide service without frontiers to your customers! 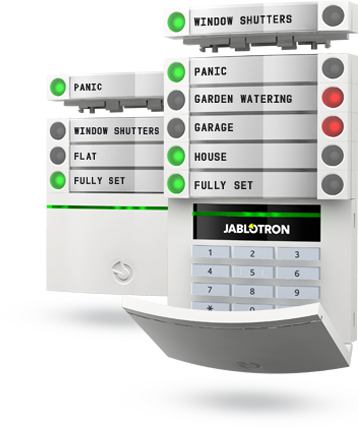 The JABLOTRON 100 alarm offers absolute freedom of selection and adapts to the security needs of any house, apartment, cottage, office or manufacturing facility. Plan its scope as you wish and as your customers need! The JABLOTRON 100 protects not only against robbers but also against fire, flooding or gas leaks. The alarm is also able to control the heating or open your garage door. 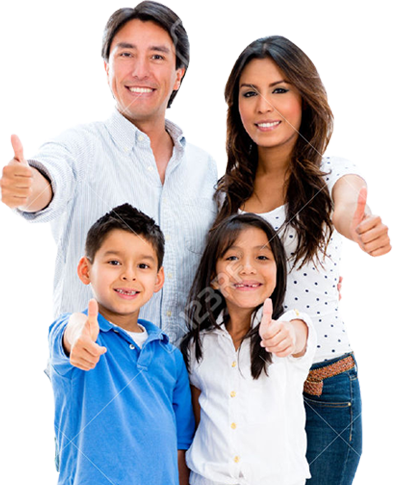 Make full use of state-of-the-art technology! The combination of the wireless and wired design of the JABLOTRON 100 allows for installation sparing not only the building but also your purse. Profit from the unique wireless technology of Jablotron!